My short story “Slalom” has just been published in The Sunlight Press, edited by Beth Burrell and Rudri Bhatt Patel. Check it out. A short story I wrote a few years ago that was published in the anthology Veterans of the Future Wars has been recorded as is now available on StarShipSofa, the Audio Science Fiction Magazine. Thanks to Ray Ortali for publishing my latest short story, Auntie Lovely Says Goodbye, in his eMagazine, We Love Books & Company, which you can download here. 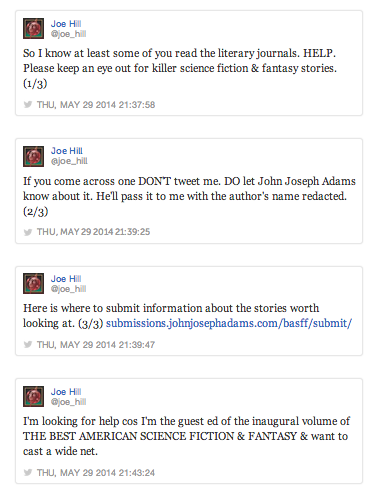 That’s right, after all these years, the “Best American …” series will finally start to showcase the best in Sci-Fi and Fantasy, and you can help guest editor Joe Hill by sending him recommendations for stories via this webpage: http://submissions.johnjosephadams.com/basff/submit/. I just got a note from the editor of the online journal Bartleby Snopes that my short story, The Duck, will be going live online next week at http://bartlebysnopes.com. So be on the lookout for the story AND be sure to stay tuned, because the story will be in competition for Story of the Month, with voting done online by readers just like you. I’ll have links to the story and to the voting site when they go live.